Thanks to tips from Melanie Nilles, Stephannie Beman, and Rose Gordon, I was able to put together this post. 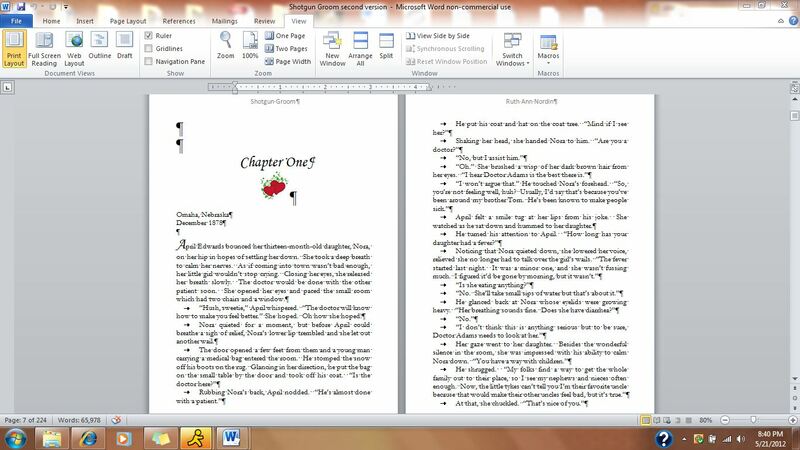 Okay, so now that you know what I start out with, I’ll go into how I format my paperback version into an ebook. 2. Delete headers and footers. I do this by clicking inside the space where the header and footer is and deleting what’s in there. 3. I select the entire book by going to the toolbar and select. Under Select, you can pick “select all”. I change the font to Times New Roman and pick 12 for the font size. 3. I get rid of all of my tabs by going to find and replace. I type ^t in the find box and leave the replace box empty. 4. I show the ruler on my toolbar. Go to View (on the toolbar) and “show ruler”. 5. 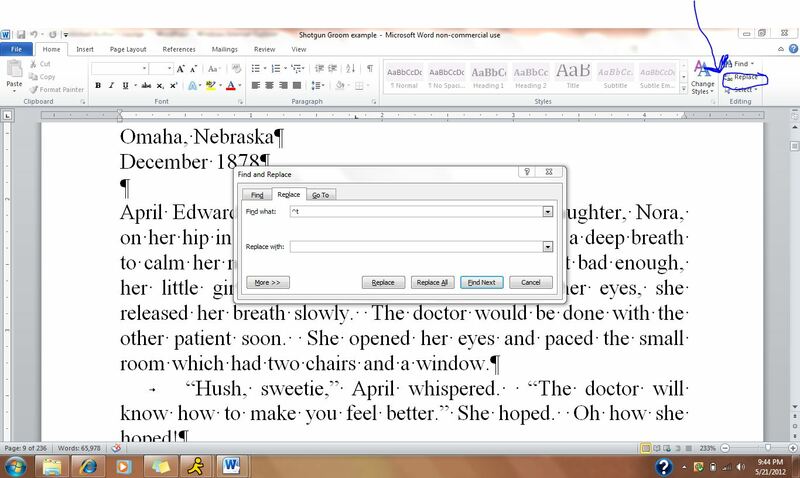 I select all of the book using the Select option on the toolbar. 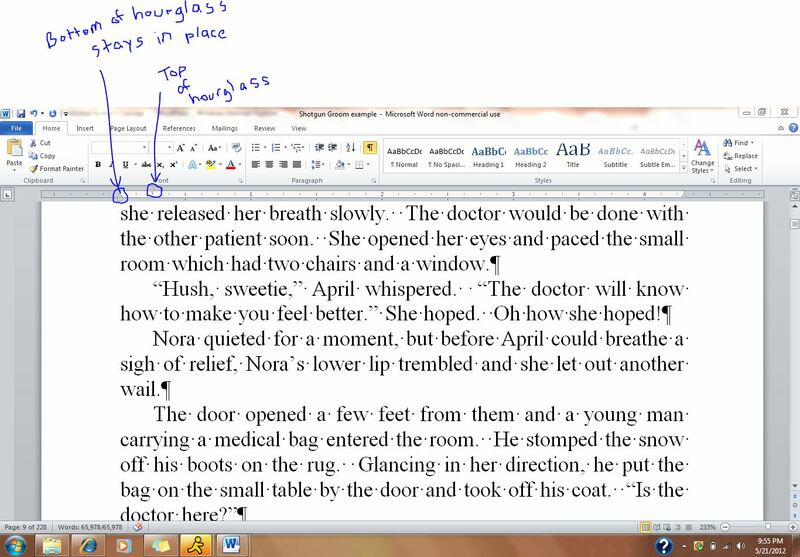 I use the top half of the hourglass icon at the left side of the toolbar to set the indent for the first line in every paragraph. Move the top half about 0.25 spots to the right. You might want to do 0.30. 6. Now I make the Table of Contents. A. 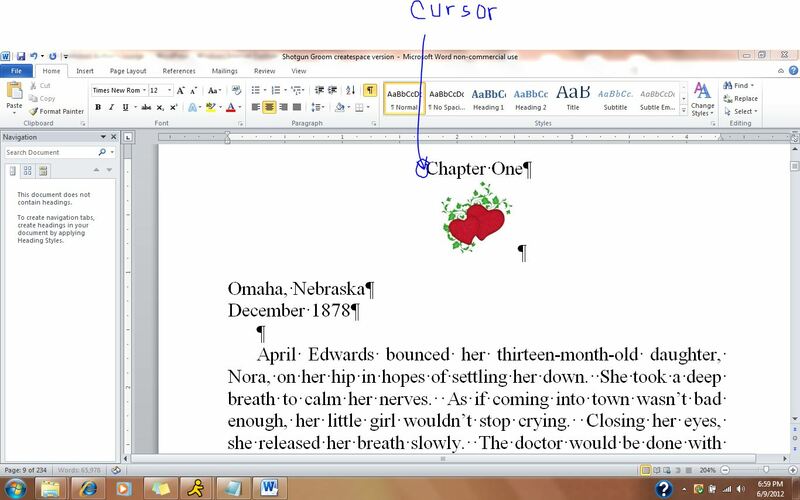 Put the cursor at the beginning of the chapter. Do NOT highlight the chapter. B. 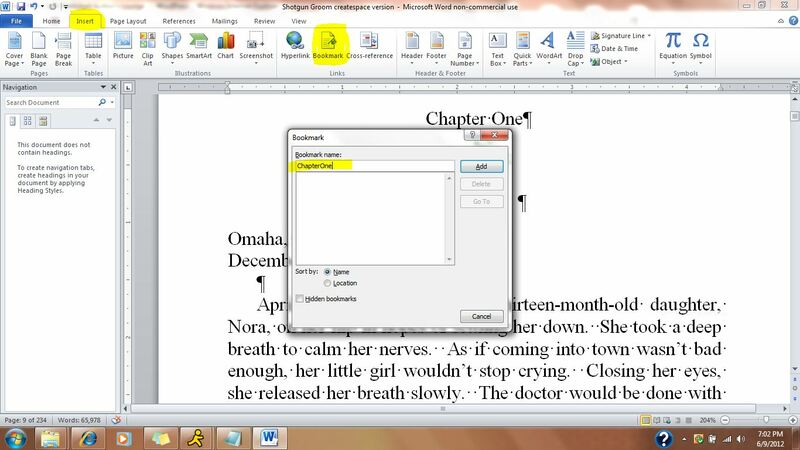 Go up to Word’s Insert menu and click the “Bookmark”. Enter a name for the bookmark and click the button to add it. Do this for every chapter. 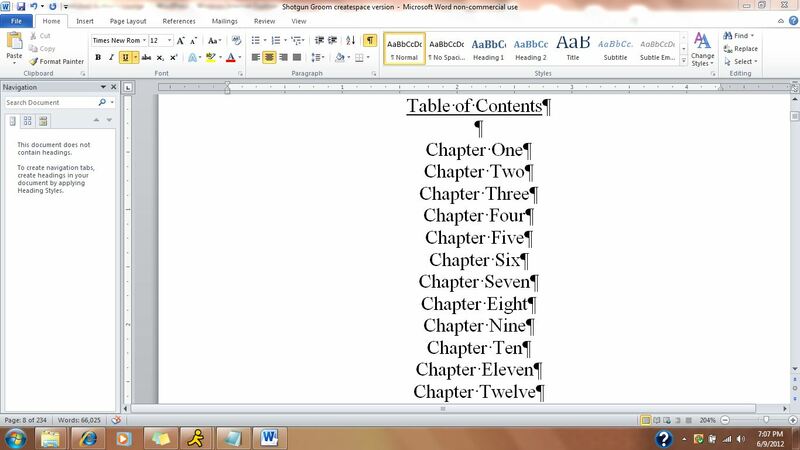 D. After you set up bookmarks for all the chapters, go to the beginning of your document and create a Table of Contents page. I do this after the copyright page. E. Highlight the first chapter name (all of the text this time). Go up to the Insert -> Hyperlink. 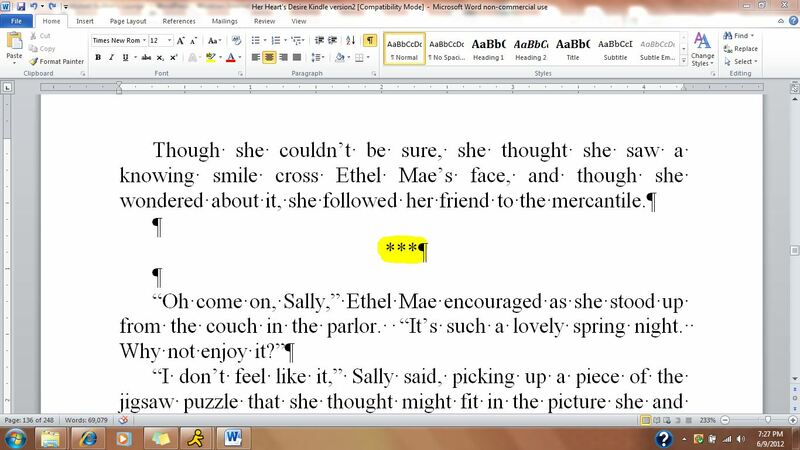 On the left side of the little window, click the “In this Document” option and look for your bookmarks. Click the bookmark link and click “ok”. The text will show as a hyperlink. F. Now repeat for every chapter down the list. 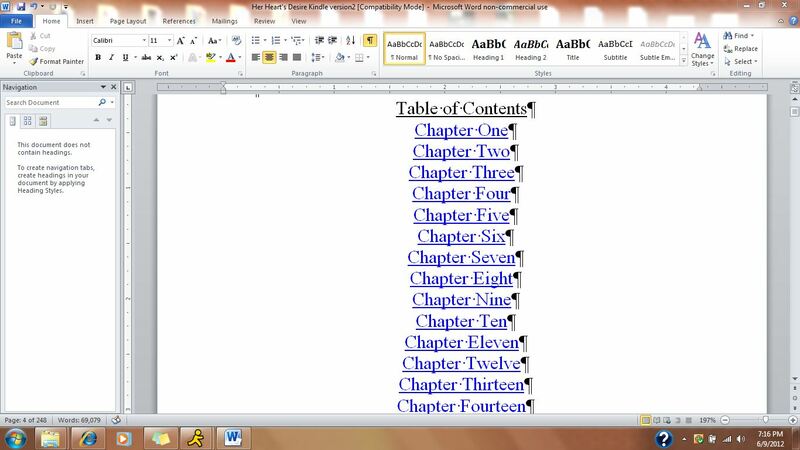 Afterwards, your table of contents should look like this. 7. 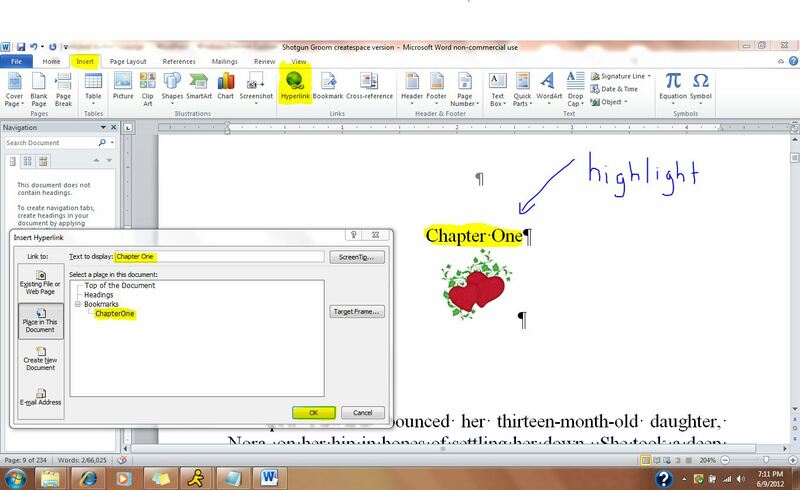 I go back through the document to make sure every chapter starts on a new page. I use page breaks between chapters. I also go and back and make sure all my drop downs (*** is what I use) is centered and only has one space between it and the text. 8. I save my changes and upload the book to Amazon KDP. I check through the Kindle previewer and make any changes necessary. 1. 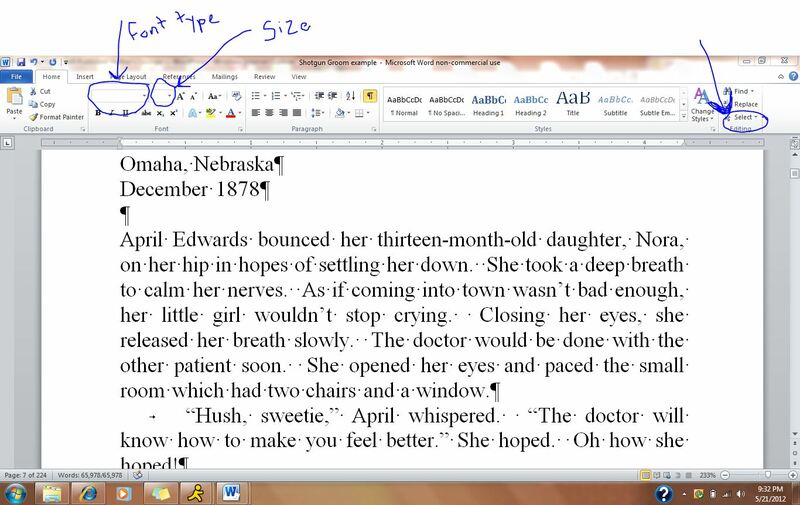 I save the document as Word 2003 and label it “Title of Book Barnes and Noble version” (Ex. Shotgun Groom Barnes and Noble version). 3. I bought a program called Word Atlantis. I close the Barnes and Noble version of my book. I open Word Atlantis and then open the Barnes and Noble version of my book. 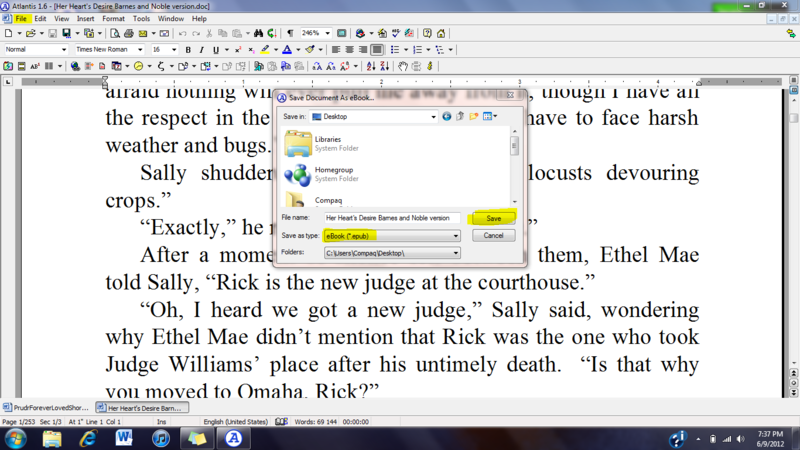 From there, I go to File -> Save Special -> Save As Ebook. This will save your document as an Epub file, and it’ll save all of your formatting so it’s clean in PubIt. 4. Upload the book to PubIt and go through it to make sure it’s formatted right. 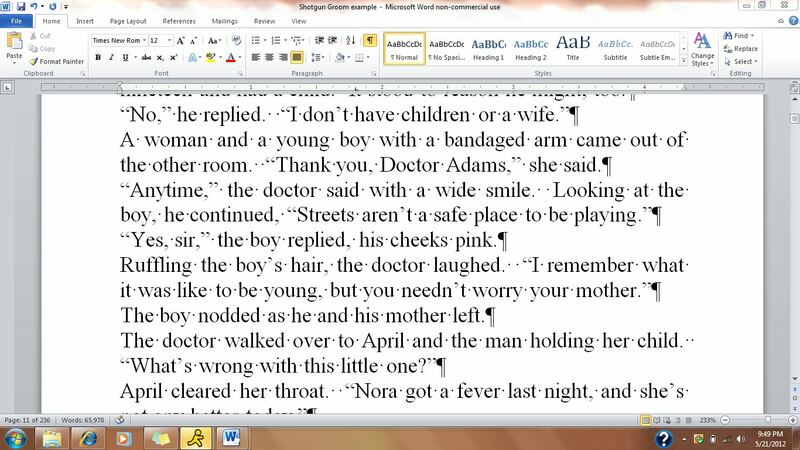 You can use the Barnes and Noble version (prior to making it an Epub file through Word Atlantis. This ebook is licensed for your personal enjoyment only. This ebook may not be re-sold. If you would like to share this book with another person, please do. Thank you for respecting the hard work of this author. If all else fails with Smashwords and you can’t the document approved for premium distribution, I’d take the entire book and put it in Notepad to eliminate all formatting. Then copy it and put it back into Word 2003. I’d make sure there is a space between all paragraphs, center the title page, center all chapter headings, make the table of contents, make page breaks at the end of each chapter or insert a symbol at the end of each chapter. I’d also use a page break or symbol after the title page, copyright page, dedication page, or any other page that comes before the beginning of the story. 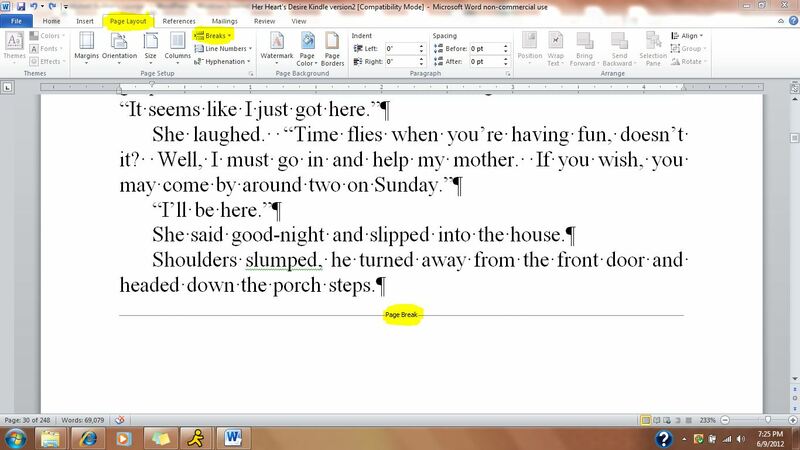 You’ll have to go back and underline or italicize anything you had in the book prior to putting it in Notepad. When in doubt, make the book as simple as possible. Some people think it has to be fancy to sell, but the truth is, if the book is clean and easy to read and readers enjoy the story, all the bells and whistles in formatting aren’t necessary. 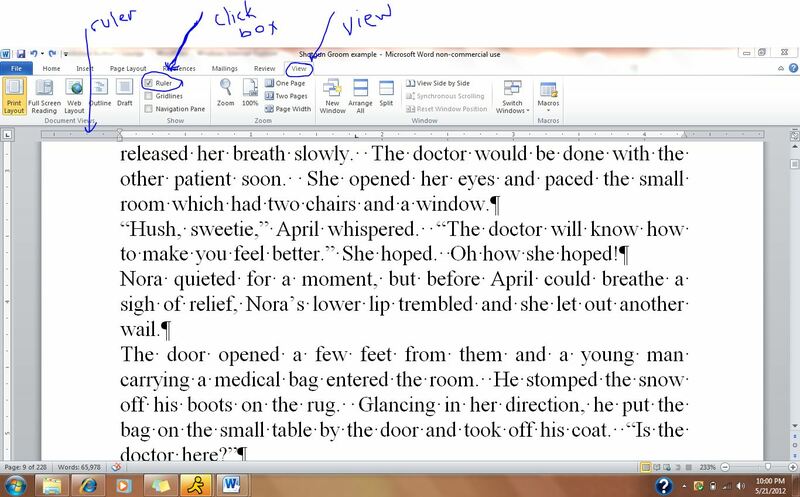 If anyone has any formatting tips they’d like to share, please do. The more input we have on this issue, the better.